Posted on March 7, 2014 at 08:47. Hope Industrial Displays are built to handle abuse of many forms. Our displays are used in a wide variety of extremely tough environments where they see everything from daily steam cleanings to chemical exposure to the occasional run-in with a forklift. But every once in awhile our repairs department sees a particularly tortured product come in for repair. Consider the following: this Universal Mount 19″ Touch Screen has been in service for nearly 7 years inside an industrial equipment paint booth. 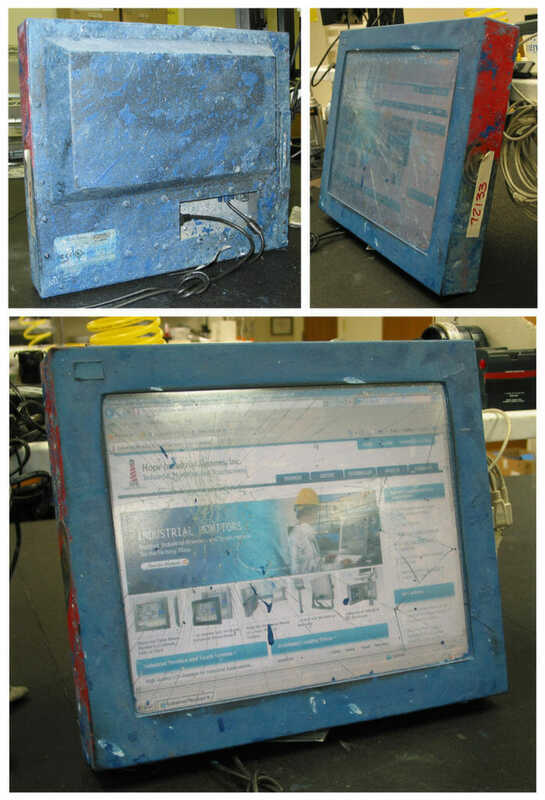 During this time, the monitor has been subjected to constant heat, paint over-spray, and dousing with solvents to keep the worst of the paint off of the touch screen’s acrylic surface. In the end, a particularly hard impact to the front surface of the display broke the touch screen glass substrate, even though the LCD was protected and is still operational. A quick touch sensor replacement and this display will be back in action.